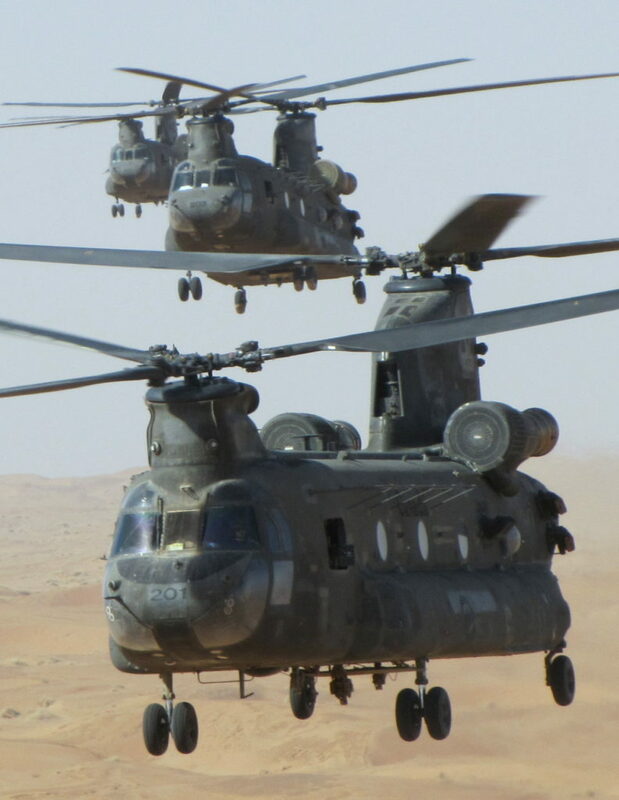 Three Canadian Chinooks flying in southern Afghanistan. I am piloting the third machine in this photo. Not long after I reported for duty in Edmonton, the federal government decided to augment our forces in southern Afghanistan by sending a contingent of Chinook and Griffon helicopters. Capable of carrying large number of personnel and cargo, the CH-47D Chinook was the premier workhorse helicopter of western military forces. Think of it as a flying combination of a tractor trailer and city bus. 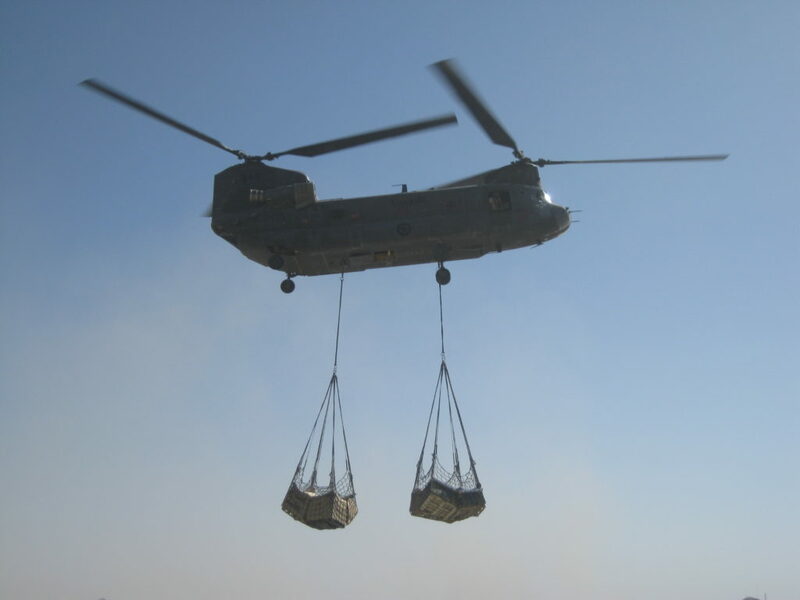 With two 3750 HP engines and the ability to carry up to 26 000 lbs of cargo, there was not much that the Chinook could not lift or carry. Due to the Taliban’s use of roadside bombs, aerial transport was a hot commodity in Afghanistan. To drive in a convoy from the westernmost Canadian camp to the main base at Kandahar Airfield took a day or more. To fly by helicopter took 15 minutes. Because Canada did not currently have Chinook helicopters, the plan was that we would take delivery of six Chinooks already in Kandahar from an American unit which was rotating home. Before going overseas, the Canadian aircrew would conduct all our flight training in the United States with the US Army. A less than perfect arrangement, but necessary because of the short timelines. My home for the 9 months. Located just off the flight line, it was a noisy but at least they were air conditioned. When I reported for duty in Edmonton, I was assigned the position of the Chinook Company Commander with primary responsibility for the 30 pilots, flight engineers and door gunners that manned the flight. In November 2008 I departed for Fort Rucker, Alabama for three months of flight training. A vast base, Fort Rucker is the home of US Army Aviation and where all US Army pilots are trained. The training there taught us the bare basics of how to fly the Chinook. To help fill out our training, I did separate two week stints in Mississippi and California, flying with their National Guard. 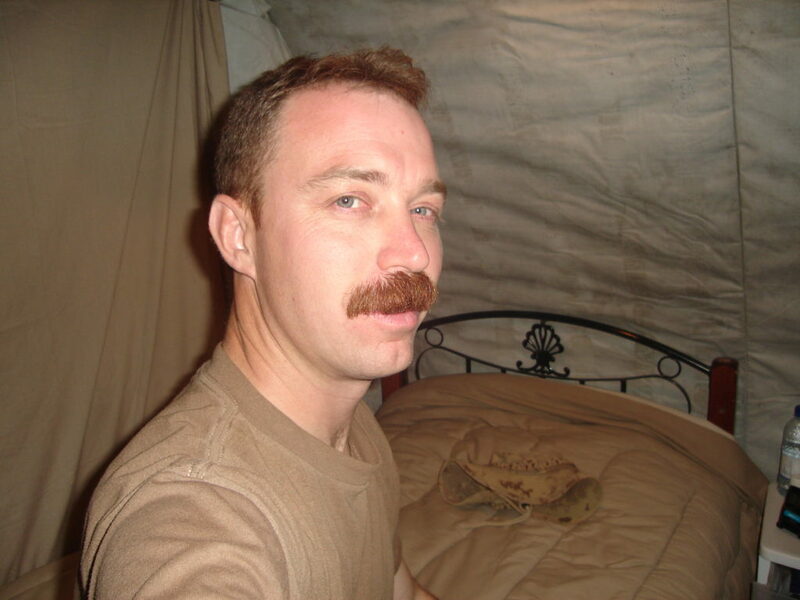 After more months of preparation and unit level exercises, I deployed to Kandahar in early Oct 2009. All told, it had only been 16 months between departing Kabul and arriving in Kandahar. In addition to the short turn-around, it had been decided that our tour in Kandahar would be nine months in length rather than the normal six. Flying the Chinook in Afghanistan was truly a once in a lifetime experience. The D Model Chinooks which we took delivery of were at the time the most combat capable helicopter Canada has ever fielded. They needed to be. The Taliban in Kandahar was a very real presence, and very motivated to do us harm. Several times we had aircraft came back to base with a extra holes in them that they did not start off with. A few weeks after I rotated home, a Canadian Chinook was shot down just outside one of the main Canadian Forward Operating Bases (FOB), an area I had operated in routinely. Arguably just as dangerous as the insurgency was the general inhospitable nature of Afghanistan. Extreme heat (50+ degrees Celsius), high base altitude, mountainous terrain, unnervingly dark nights, and a pervasive dust that covers the entire countryside, all made flying in Afghanistan a challenge. Also, at the time Kandahar Airfield (KAF) was the busiest single runway airport in the world supporting untold numbers of helicopters, jet fighters, transport aircraft, and unmanned aerial vehicles. 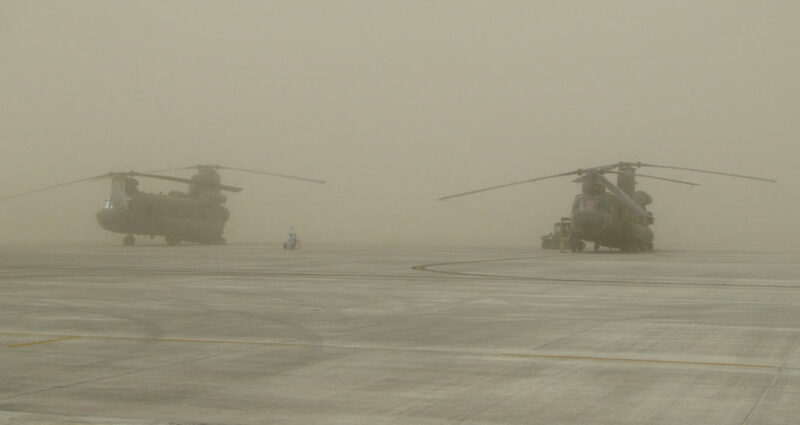 The airfield ramp during a typical dust storm. 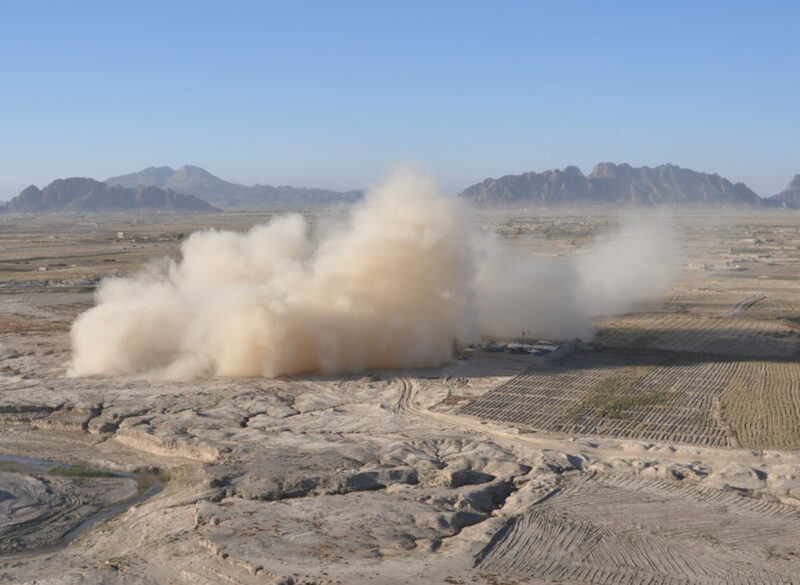 To call Kandahar dusty truly doesn’t do it justice. If you can imagine the countryside covered by an inch of talcum powder, then you would be in the ball park. Even simple tasks such as taking off or landing could pose significant dangers depending on how the landing zone was prepared. During the summer, dust storms were a constant hazard. 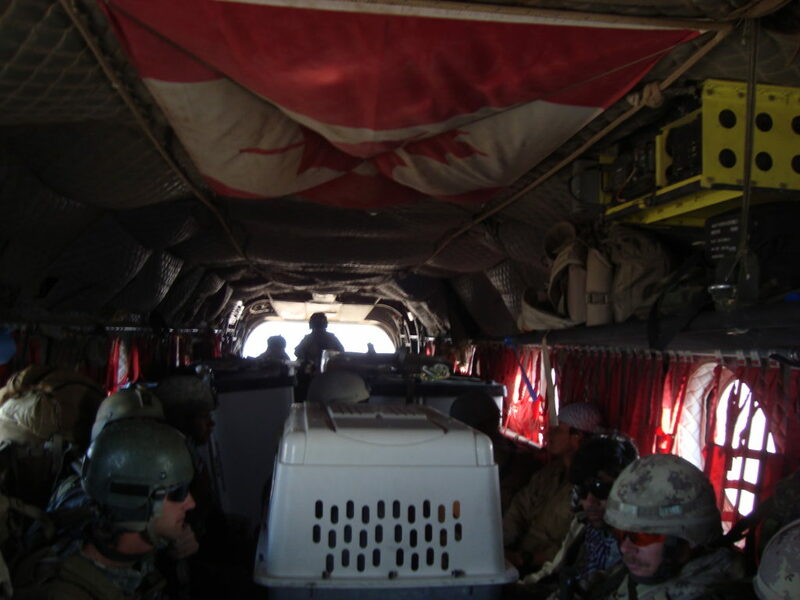 The cargo area of a Chinook during a typical Ring Route. A mix of cargo and passengers. The dog carrier you see in this picture was normal occurrence. Service dogs were extremely valuable in detecting roadside bombs. The bread and butter of the Chinook’s workload was what we called ring routes. A ring route was basically a bus service between the multiple camps in Kandahar province. 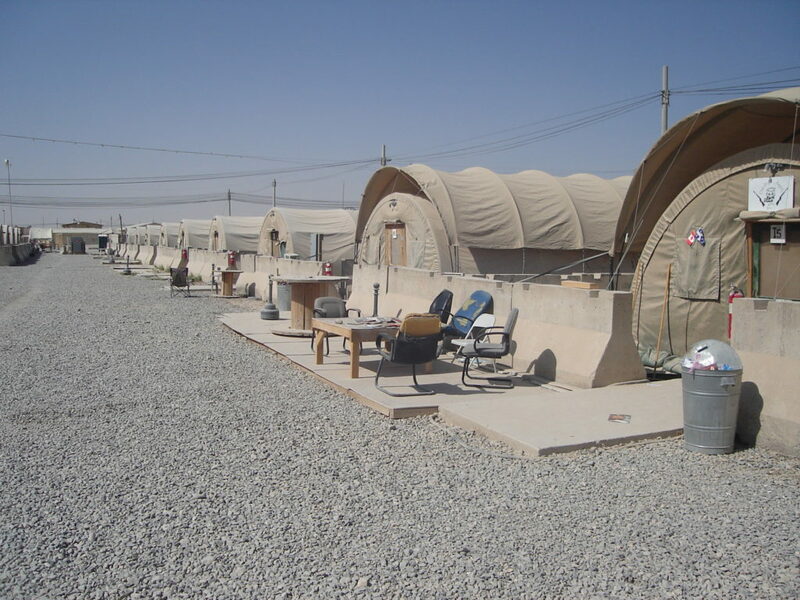 Starting at Kandahar Airfield (KAF), we would fly a scheduled route to a succession of different camps where personnel and cargo would be loaded and unloaded and then return to KAF. This would then be repeated multiple times to different sets of camps. The average amount of flying time for one of these missions was about 5 hrs. On a busy day, we could move upwards of 200 people and thousands of pounds of cargo. We would carry food, water, ammunition, mail, luggage, spare parts, even smaller vehicles all internally in our cabin. Suspended from the cargo hooks underneath the helicopter we would carry pallets of cargo as well as larger vehicles or artillery pieces. In addition to the ring routes, our other task was to conduct air assaults. This involved putting a force of soldiers into unprepared landing areas, typically at night. This would allow the ground force an element of surprise when attempting to search a specific compound or patrol a town that is a distance away from their camp. The most significant air assault that we completed during my tour of duty was a multinational endeavor called Operation Moshtarak. In neighbouring Helmand province which the British were resonsible for, there were two large areas that the Afghan government had no presence in. The Taliban still ruled in these areas through fear and intimidation. Op Moshtarak was a major push of NATO and Afghan troops into these areas to assert the authority of the Government of Afghanistan. The first wave of this surge was to be a night time air assault carried out by the US Marine Corp, US Army, Royal Air Force, and the Canadian Air Force. Our unit while in Helmand province assisting the British during Operation MOSHTARAK. In utter blackness we conducted 3 waves of landings, putting in a total of over 300 British, Estonian and Afghan soldiers. The timings for all take-offs and landings were tightly choreographed as US and British helicopters were conducting landings only a few kilometres on either side of us. As well, the entire event was assisted by a high flying C-130 Hercules aircraft which was dropping infra-red para-flares to allow our night vision goggles sufficient light to be effective during the moonless night. To view the story that Tara Nelson filed on the event, click on this thumbnail. We had significant numbers of journalists embedded with us for this operation. Personally, I had Tara Nelson (at the time with Global TV) and a cameraman assigned to me. They shadowed us for the duration of the event, including flying with us for the actual assault. Having the press embedded with us was a great experience. It showed them the detailed planning and rehearsals that are needed to conduct these types of operations. Having them fly with us for one mission made them intensely aware of the risks we took every day. 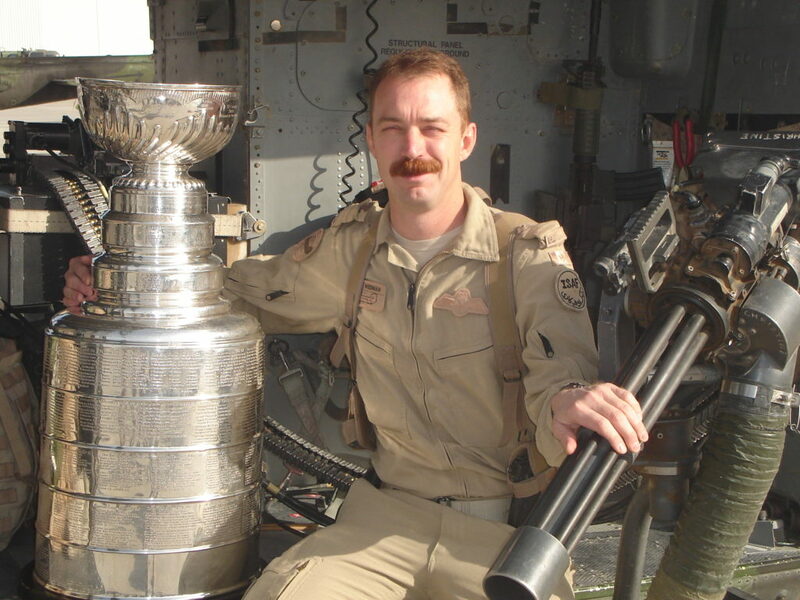 Lord Stanley in one of the Griffon helicopters that provided close protection and overwatch on every Chinook mission. One of the lighter sides of the deployment to Afghanistan was the “Team Canada” visits. Once during each tour, a group of ex-NHLers and some musicians would came to Kandahar. There were ball hockey games, concerts, visits to all the units, and a general chance to get close to people that normally the soldiers would never meet. For me, highlights were being able to get a hero shot with the Stanley Cup, and comparing moustaches with Lanny McDonald in the back of a Chinook. I returned to Canada in mid July 2010 after over 9 months of operations. By end tour, I had personally completed 82 combat flying missions. Being Edmonton born and raised, it is tough for me to get on board with any Calgary Flame. 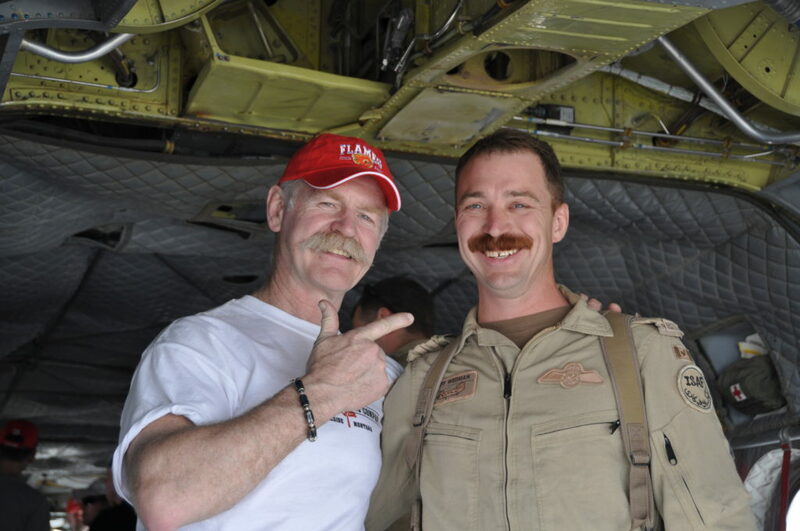 But for a class act like Lanny McDonald, I had to make an exception. It was a perhaps the longest 9 months of my life. The heat, the dust, the lack of privacy inherent to communal living, the threat inherent to every mission, the annoyance of the semi-regular rocket attacks against the airfield, they all contributed to wear you down. The pace of operations was relentless, we operated 7 days a week with only an occasional down day to let our aircraft maintenance catch up. When a Canadian unit suffered a casualty, we would send a Chinook to bring that squad back to the main base at the airfield. We did this to give them a couple days to process their loss, and so they could attend the ramp ceremony for their fallen mates. I find it difficult to adequately describe the ramp ceremonies. Masses of soldiers would form a long corridor on the airfield ramp to pay a silent vigil as the caskets were loaded onto their last flight home. The raw emotion of soldiers carrying their fallen brothers and sisters onto the plane, I thank God that I was blessed to have not had to do that with someone from my own unit. I was at the ramp ceremony after we lost 5 people to a single roadside bomb, one being the Calgary Herald journalist Michelle Lang. The length of time it took to troop the five caskets past us, it seemed like an eternity. The ramp ceremony that impacts me the most still today was for a Romanian soldier who had been killed in the province next to us. Even though the Romanians did not have a big contingent, a large collection of soldiers from multiple nations formed up on the ramp. After they trooped the fallen soldier into the aircraft, the Romanian Padre came out and addressed the parade. He thanked everyone for paying their respects. As he finished he added as almost an aside “All this for a simple Romanian soldier.” He was amazed and surprised that we would consider a Romanian private worthy of such basic respect and acknowledgment. A selfie from my luxurious sleeping quarters. It was still better than what most of the soldiers had out in the forward operating bases. I am often asked what was the point of Canada going to Afghanistan? Why did we go over there? What I saw at the time was that the Taliban had its tentacles throughout all of Afghan society. The Taliban’s world view was devoid of what we would consider base humanity. To them there were no innocents but merely objects to be controlled and used, or obstacles to be destroyed. The evil the Taliban perpetrated was driving the country deeper and deeper into the abyss. No serious attempt at reform, at having the Afghan people experience a taste of freedom and the ability to make choices for themselves, could be undertaken until the Taliban had been temporarily pushed back. I describe the goal and result of our intervention into southern Afghanistan as that we gave Afghanistan some breathing space. A period of time when the Taliban was not an existential threat. A period of time during which the Afghan people could focus more of their attention and efforts on deciding what kind of society they wanted to have than just merely surviving. I felt that doing what I could to give the Afghan people a chance for success was worth the personal risk. Without our help, this was just not possible. Ultimately, no outside force of arms will ever bring a lasting peace to Afghanistan. Only the people of Afghanistan can do this by coming together under one mind and fighting for their own freedom. When I was in Kabul, my interpreter’s wife gave birth to their second child. When I asked him if he was planning on having a large family, he told me that they were stopping at two children. When I asked him why, he stated it was because he only had a small car. If sometime in the future everything collapsed and he had to flee Kabul, he wouldn’t be able to fit any more than two children in the car. I wonder if he was being a pessimist, a realist, or just hoping for the best but preparing for the worst. Regardless, by working for us he was taking a stand and risking himself and his whole family. Many thousands of Afghan soldiers lose their lives every year holding back the Taliban. The loss of each and every soldier, whether they are Canadian or Afghan, is a tragedy. The tragedy isn’t that they fought and died. The tragedy is that the tyranny of others created the situation where the only two options were to fight and risk death, or to watch Afghanistan lose the freedoms they had just recently gained.